There is a surprising amount of chemicals and pollutants floating around in the average household, and there is plenty of research proving that houseplants can clean many of these toxins up. Plants are great because they provide a natural, cost effective way of cleaning the indoor air, plus they can make the inside of your home look fresh and inviting. The following is an explanation of how plants are so effective at cleaning the air in your home, and some examples of the best plants to use. Although there are some types of plants that are more effective at scrubbing toxins out of the air, virtually all plants can make for powerful air cleaners. Through the pores on the leaves, carbon dioxide and other pollutants enter the plant. Through a series of complex chemical processes and reactions within the leaf, photosynthesis takes place and oxygen is released back into the air. Not only are plants effective at filtering out the toxins in your living space, but they also release oxygen in a more pure form. When there are airborne toxins floating around in your living space, they are interfering with your body, particularly your eyes, nose, throat and respiratory system. Benzene is a commonly used solvent that can be found in tobacco smoke, gasoline, ink, oil, paint, plastic and rubber. You will also become exposed to benzene when you use manufactured detergents, pharmaceuticals and dyes. If you are exposed to benzene, it may cause dizziness, nervousness, headaches and anaemia, as well as irritated skin and eyes. You can help purify the air, while adding colour to your home, by making a flower arrangement out of gerbera daisies, chrysanthemums and peace lilies, or by using other common plants such as bamboo palm, English ivy and snake plant. In virtually every indoor environment you will find formaldehyde. The major sources of this airborne contaminant are insulation, particleboard and paper products, as well as most commercial cleaning products. Formaldehyde can affect your health by irritating the mucous membranes of your upper respiratory system and can increase the risk of asthma for you or your family. The peace lily flower can help remove formaldehyde from the air in your home as well as bamboo palm, corn plant, snake plant, spider plant, golden pothos and heartleaf philodendron. There are a wide variety of industrial uses for trichloroethylene (TCE) including in inks, paints, varnishes and adhesives. TCE can affect your central nervous system and cause dizziness, confusion and headaches, and, in high concentrations, can lead to unconsciousness. 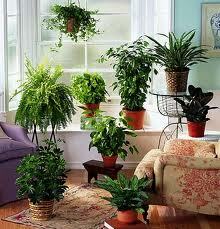 Plants that can purify the air of TCEs include gerbera daisy, chrysanthemum, peace lily, corn plant and bamboo palm. So why not put a plant in your home? Doing so will increase the overall health of you and your family by providing clean, fresh air to breathe. oh, i love plants, Lina! someday, somehow, i will have them in my house, lol!